How alkaline hydrolysis – or “water cremation” – offers a greener way of dealing with the body after death. This is a story about what happens to your body after you die. In many countries, the current options are burial and cremation, but, both methods come with significant environmental impacts. We’re running out of space for burial in many places, and cremation carries the risk of toxins and greenhouse gases being released. For World Hacks, Sahar Zand travels to the US, where they’re using a new process to deal with the dead. 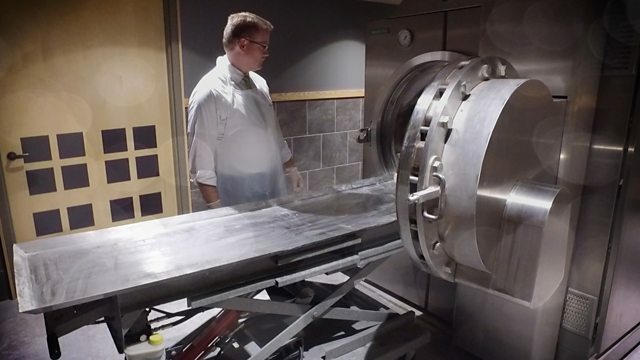 It’s been called “green cremation,” “water cremation” or “resomation” and uses alkaline hydrolysis to mimic and accelerate the breakdown of tissue that would occur in burial. Those who invented the process say it’s an environmentally friendly way to address this fundamental moment in the human life-cycle, but does the evidence stack up?